The deadline for the renewal of your ACP membership is approaching fast. There are only several days left until March 1, but if you haven’t done it already you still have the time to do so. Whether by bank transfer or PayPal (using our address paypal@chessprofessionals.org) you can find all the information on our Registration webpage here. There are good reasons why you should continue with us and you know most of them. This time we would like to talk about our opens and the conditions we have secured for our Premiums in them. The first one coming up in May is the Llucmajor open, taking place in the magnificent Mallorca. The dates are May 13 (day of the blitz, first round is on 14) to 21 and we are adding 3000 EUR for our Premium Members above the regular prize fund. Special conditions for our Premium Members with 2600+ include full board in single room, travel expenses and pocket money. ACP Premium Members with rating below 2600 will receive half board in double room. For the time being there are 30 places, so if you would like to play please contact us at secretary@chessprofessionals.org and yg@chessprofessionals.org – based on the ACP Tour March 2 standings we will allocate the conditions accordingly. The official site with the tournament regulations can be found here. Next is Porto Mannu in yet another fantastic location from June 3-10. The official website is http://portomannu.caissa.it/en. Sardinia will welcome you with open arms with special conditions for one Premium with full board in single room and pocket money. Wild cards will be assigned on March 31. If you are interested, please contact yg@chessprofessionals.org on or before March 17. In July we have two tournaments. The Najdorf Memorial in Warsaw will take place from July 8 to 17 and will be one of the strongest opens in the World this summer, with a prize fund of 30 000 EUR, out of which 20 000 EUR for the A Tournament. 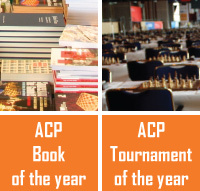 All of 20 ACP Premiums will receive special conditions (single room, pocket money and travel expenses depending on rating) and we will publish the list of the ACP special prizes later on. And from July 14-16 we have Bergamo (http://bergamo.caissa.it/en) with the same conditions as Porto Mannu - one spot with full board in single room and pocket money. Wild cards will be assigned on April 30. If you are interested, please contact yg@chessprofessionals.org on or before April 26. As usual, there will be special prizes for ACP Premiums in the Individual European Championship: 6000 EUR in the open section (Minsk, May 29– June 10) and 5000 EUR for the women’s tournament (Riga, April 10–23). As you can see, we are working hard on improving the conditions for our members. Help us continue our work by renewing your membership – use our PayPal address (paypal@chessprofessionals.org) or consult our Registration webpage here.